During the recent New York trip I took with my parents, we visited the Chelsea neighborhood. We spent the morning in the Chelsea Market, a multi-story building that used to be occupied by the National Biscuit Company (Nabisco) commercial bakery. When production methods changes required a single-floor layout, the bakery moved out. It’s here, where the Oreo was first created. Inside the market, we found One Lucky Duck. 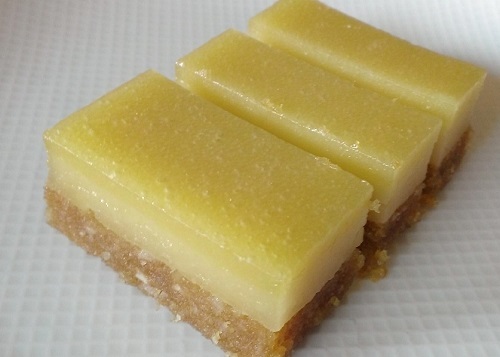 They offer all-vegan, raw organic juices and take-away, and happen to have amazing desserts. It’s part of the Pure Food and Wine establishment so you know you’re going to be wowed. Next door, Beyond Sushi truly satisfied. This all plant-based sushi establishment incorporated flavor, color and presentation like no other sushi place I’ve seen. Their rolls were scrumptious and fueled us as well. 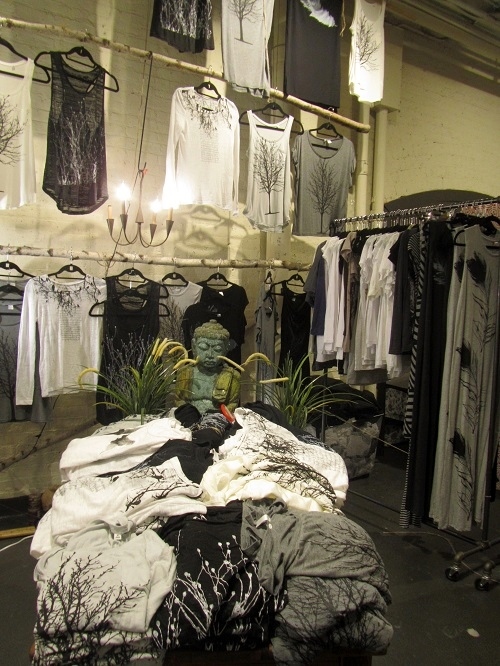 I was thrilled to stumble into a pop-up shop in the market, where several vendors had set up their wares. One of them was designer Lois Eastlund. I liked the shop across from Lois’ store too. My mom was sweet enough to buy me one of their screen-printed tops. 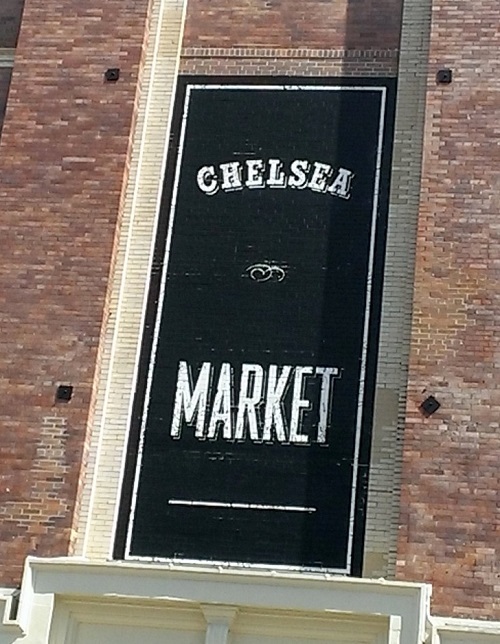 There’s more to Chelsea than just the market. One evening we met my friend Shannon, a recent New York transplant, at Blossom vegan restaurant. 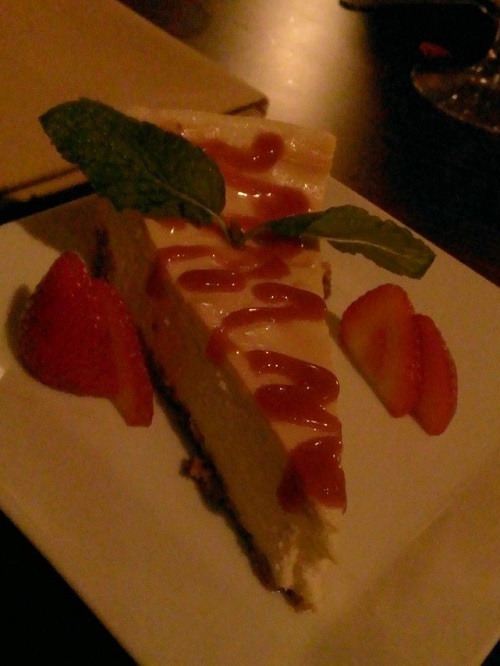 We ate delicious food and even had authentic (and dairy-free) New York Cheesecake! Another Chelsea gem is the popular High Line, an elevated former rail line that was transformed into a greenway. The rail line used to bring animals into the city for slaughter. I prefer its use as a park! New York is such a fun place. Have you ever been to Chelsea? Hi, I wish to visit Chealsea, as other stylish and less stylish parts of NYC. I see you had great time there! Thanks for writing, Gee Gee. I hope you get it Chelsea. There are so many beautiful parts of NYC and Chelsea is at the top of the list. 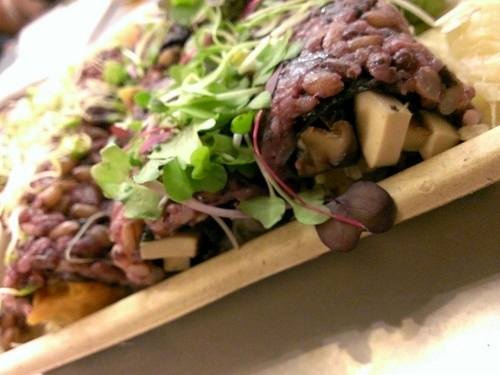 We sure were WOWED by all the vegan restaurants and their delicious menus! The vegan cheese cake was better than any dairy cheese cake I’ve ever eaten! Love the zigzag dress and it will look great with black tights and boots when the weather gets cooler. I’ve worn my screen-print top and I’m so glad I bought it. 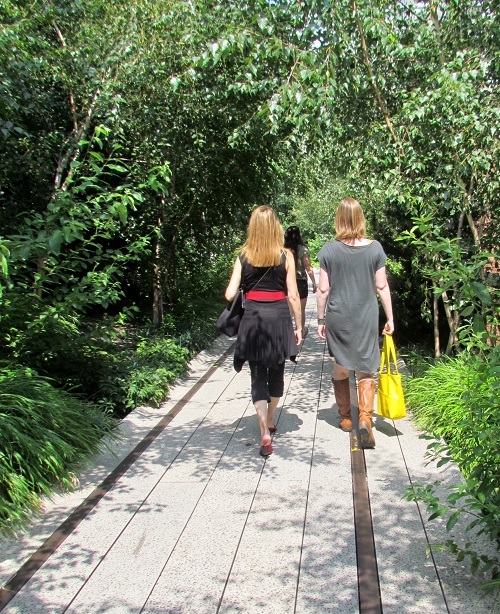 Meeting with Shannon on her first anniversary of living in NYC was fun and the High Line was fantastic! Have I ever been to Chelsea? Thanks to you – YES! and I’d love to go again someday. There were so many wonderful choices in vegan restaurants, weren’t there? I want to try them all! I agree that Blossom’s “cheesecake” was the best I’ve had, dairy or vegan. I’m definitely wearing my zigzag dress with tights and boots! It’s a great year-round piece. I’m glad we had a local (Shannon) to take us on a tour. The Highline is fantastic (and so different) night and day. I wouldn’t have ventured up there at night but I’m glad we did. It was hopping!